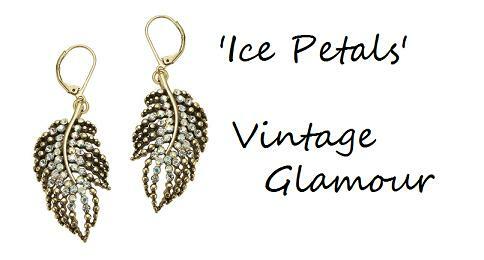 A beautiful collection based on 'vintage glamour' with flower and feather motifs. Decorated with lots of sparkling Swarovski crystals, paste jewels and pearls. Available in grey/black hematite plate and burnished gold versions. Beautiful flower and feather necklace. Largest flower 4cm/40mm. Largest feather 7cm/70mm. Length of the front drop 12cm/120mm. Mixed metal twist chain that measures 40.5cm/16 inches upto 48cm/19 inches. Feather and chain drape pendant necklace. Encrusted with Swarovski crystals. Feather measures 7cm/70mm. Front drop 10cm/100mm. Mixed metal twisted chain measures 15.5 inches/40cm to an adjustable 19 inches/49 cm. Sinuous feather earrings. Encrusted with Swarovski crystals. Feather measures 4cm/40mm. Total length 6cm/60mm. French clip for pierced ears. Sinuous feather crystal drop earrings. Encrusted with Swarovski crystals and a crystal drop. Feather measures 2.8cm/28mm. Total length 7cm/70mm. Stud/post style for pierced ears. Sinuous feather hair clip. Encrusted with Swarovski crystals. Feather measures 4cm/40mm. Total length 5cm/50mm. Sprung clip (measures 4cm/40mm) for a section of hair. Beautiful flower and feather bracelet. Largest flower 4cm/40mm. Feather 4cm/40mm. Length 8 inches/20cm. Toggle/bar fastener.